Sure, we’re showing our age with the outdated pop culture reference above. But, in this time of growing Internationalism, the analogy seemed appropriate after visiting one of the newer shopping centers in the high profile Myeong-dong shopping district in Seoul. Traveling the globe, previously exotic locales now somewhat blend together with the homogenization of retail. In the five years we have been traveling to this market, we have seen dramatic changes to the retail landscape. As in every part of the world, global influences are rapidly spreading. In country after country, the influence of globalization is apparent, from fast food franchises to high-end luxury goods and fast fashion. As we were walking through the new and exciting NooN shopping center, the roster of tenants reads like an international who’s who of fashion. This is the site of H&M’s first store in Korea, occupying partial space in several floors of the six story structure. H&M continues to improve its branding, visual merchandising and communications as the format evolves from its relatively no-frills beginnings to a true lifestyle powerhouse. 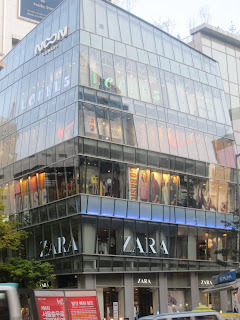 Zara and Mango, the two Spanish global brands also have presence. Zara felt a bit lost, perhaps unsure of its positioning. The thinness of merchandise and negative space used so effectively in Europe is not to be found here. Supply chain may play a factor in promising quick replenishment. 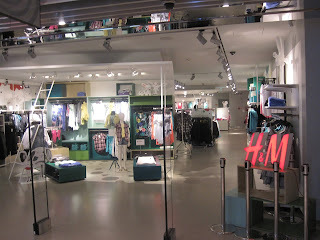 A floor of the center is devoted to sports fashion brands. Nike, Adidas and Puma all have brand shops, along with Foot Locker, strangely. Strangely, of course, because it’s selling the same brands that are in their dedicated shops. Of course, brand management in Korea always leaves something to be desired. In the incredibly (take our word for it) dense and crowded streetscape, we can encounter shops of these very same brands multiple times within a three block radius. And, you can see everything from a full-blown flagship store to a tiny footprint boutique. The fifth floor actually begins to show some Korean (or at least Japanese) flavor and heritage. It houses an extraordinarily cool collection of small independent boutiques, offering the “best of” fashions of Japan, Korea and the U.S. 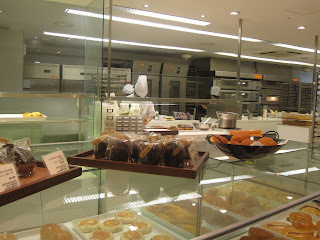 The sixth floor is a food court and yes, Starbucks and Coldstone Creamery can be found. The Singapore export Breadtalk has a small café here in addition to their street presence, with a delightful collection of bread and pastry with exhibition style baking. The dynamic parts of Seoul continue and the shopping district maintains its unique Korean identity in the thousands of shops and boutiques that dot the landscape. But, with these International brands (and spectacular Japanese brands like Muji and Uniqlo also present), it is easy to forget where you are. Only momentarily, one might add, since the sizes available don’t quite match our carb-filled American bodies! The rapid global presence of the powerhouse fast fashion brands of Zara and H&M is amazing to contemplate. Inditex (Zara’s parent) does business in over 70 countries with sales of over $13 billion while H&M is present in 30 countries with sales right behind. They have redefined the fashion business and seem to translate their business to great effect across the world. U.S. retailers, once the innovators, are struggling to keep pace. The world is indeed getting smaller. Neil, very interesting commentary about the retailers in Korea. One thing that caught my eye particularly was your comment that H&M was evolving from its "no frills" roots into a "true lifestyle" brand. 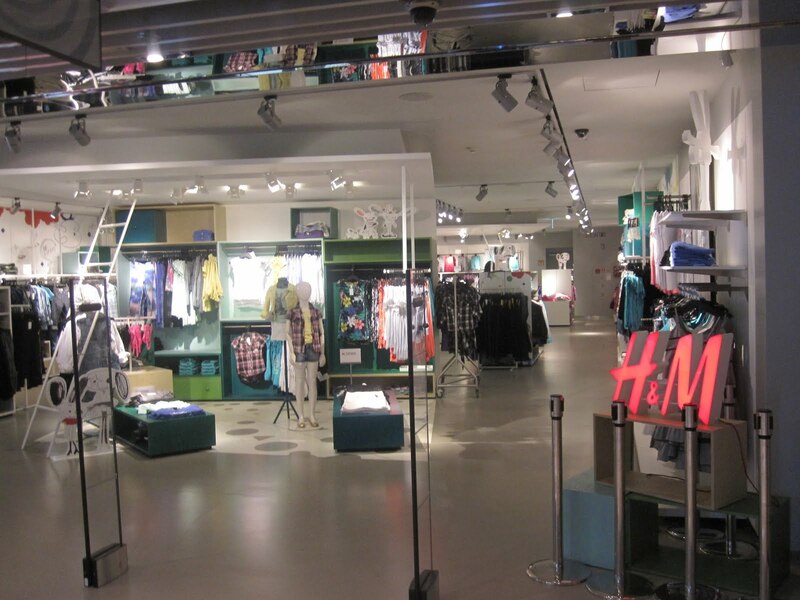 If that's true (and I suspect it is) then it spells serious trouble for H&M. What H&M doesn't want to do is start looking and feeling like Gap, and I'm afraid many of its stores are beginning to get that way. 'Lifestyle' was always a bogus concept -- it basically means charging more on the back of a marketing spiel, for a product that isn't necessarily better. Consumers finally woke up to it, and Gap and Abercrombie are now struggling as a result. The spoils went to H&M, Uniqlo and Zara, but as soon as they start moving away from their roots then they are going to struggle as well, in my view.